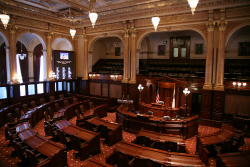 The Illinois Senate approved on Wednesday a bill that would legalize and regulate daily fantasy sports, online gambling and online poker in the state. HB 479 passed with a 42-10 vote, and now awaits a vote by the House, which will reconvene on 8 June. Though Illinois has been attempting intermittently to legalize online gambling, Wednesday's passage marks valuable headway. SB 1531, a bill that chiefly concerned itself with DFS, was also on the floor, but did not advance. Though HB 479 has been met with opposition in the form of Rivers Casino, which already operates an online gambling venture in New Jersey, the idea of legalizing online gambling in the state seems to be solidifying fairly quickly. Sen. Kwame Raoul, who is sponsoring one of the bills, told the Chicago Tribune, "There was controversy last year as to why are we regulating daily fantasy sports activity, which is ongoing in the state, and not regulating internet gaming, which is also occurring. So what this bill attempts to do is also regulate and bring licensure and supervision of internet gaming under the jurisdiction of the Gaming Board. And it would limit the operation of internet gaming to existing casinos." Lawmakers certainly see it as a step in the right direction. According to the bill, "Illinois residents participate in illegal online gambling on unregulated Internet websites operated by offshore operators who are not subject to regulation or taxation in the United States. Neither federal nor Illinois laws provide sufficient consumer protections for Illinois residents who play games of chance or skill on these illegal websites, nor does the State realize any benefits from the revenues generated nor jobs created by illegal online gaming." Online operators would be taxed at 10% on the first $100 million of annual revenue and at 15% on more than $100 million in revenue during the first five years. The tax for DFS is a little more involved: Operators would pay 5% tax on the first $1 million in revenue, 7.5% on revenue between $1 million and $3 million, 10% on revenue between $3 million and 48 million and 15% on revenue totaling over $8 million. Fantasy sports is expected to generate $2-$5 million in revenue, while online gambling is projected to generate $29.5-$42 million. Illinois Senate approves last-minute online gambling and DFS bill is republished from Online.CasinoCity.com.